A magic trick you can perform with your phone. Watch the demo video to see the effect. The application is loaded with information and photos about Houdini, and contains detailed instructions how to perform the magic. 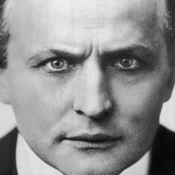 The magician shows photos of Houdini, and ask the spectator to look into Houdini's eyes and think of a card. When the spectator says what his card was, the magician shows that Houdini's brother is holding this exact card in his hand in a photo taken 100 years ago. The handling is easy to learn and master. The card is freely selected.